As we drove through the falling snow, we passed by houses that surely were uninhabitable. The broken natural gas pipes spoke of no protection from the cold. The lack of stores and gas stations pointed to the lack of jobs and provision of food. Here in this town, decimated through recent years of conflict, we found a people just trying to survive. When we stopped in the middle of nowhere, out from the homes came the cold and starving, the destitute and alone. They gathered around, and I saw both young and old, who wanted to hear a word of hope. 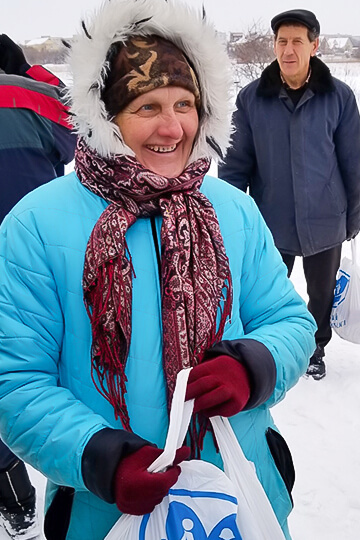 They drew close in the snow to hear the Gospel preached and an encouraging word — that they are not alone and not forgotten. The message of Christmas was extended: hope has come in Jesus Christ. We were there only that one day. But week after week faithful local churches supported through SGA — even at risk to their own lives — bring food and other aid several times a month. Without this help, the people would certainly perish. And it is there that bridges are built for the Gospel and the Word is going forth. The local church had dwindled down to a congregation of five since the conflict began, but it is now full to the walls with people praising God for His peace in the storms of life! I am grateful to God for all of you who give to this need in Ukraine. As I stood in the snow, when I saw the devastation, I could hardly breathe and tears filled my eyes. And when I preached hope and as we handed out food, I was reminded of the goodness of God in this lost and hurting world. God heard their cries and raised up a local Bible teaching church that walks forward each day in love and truth. Thank you for supporting this vital and God empowered ministry to those in spiritual and physical need.